Jan Müller’s heart gave out when he was 36. The brevity of his life is mentioned in just about everything written about him, but his tragedy is unlike those of other, more famous artists who died too young — whether it’s Masaccio (1401–28), Egon Schiele (1890–1918), Amedio Modigliani (1884–1920) or Vincent van Gogh (1853–90). The difference is that Müller knew that he was on borrowed time, and just about everything written about him will mention that “he lived constantly with the sound of the artificial valve in his heart which marked his lifebeat,” as Martica Sawin put it in a 1959 Arts magazine article (reprinted in the beautiful online catalogue for Faust and Other Tales: The Paintings of Jan Müller, currently at the Lori Bookstein Gallery). According to Sawin’s account: Müller was born in Hamburg, Germany, in 1922 … His parents were active in the German Socialist movement, and his father, a political scientist, spent several years in a concentration camp during the early years of the Nazi regime. On his release the family began enforced travels — to Czechoslovakia, Switzerland, Holland and then a refugee camp in Southern France — which finally brought Jan, by way of Lisbon, to New York in 1941. While in Switzerland, “where plunges in the snow were part of the program to build physical endurance, [Müller] developed rheumatic fever which severely weakened his heart.” By 1954 his health had so deteriorated that he submitted to surgery and a rudimentary, ticking pacemaker just to stay alive. It’s little wonder that Müller was drawn to the legend of Faust. In the poems, plays, operas and films based on his story, Faust is an extraordinary man (“smarter than all the shysters / The doctors, and teachers, and scribes, and Christers,” in Walter Kauffmann’s 1961 translation of Goethe) who cheapens his life by wanting to wring the most he can out of it. The “upheaval in his breast” speaks directly to the relentless ticking in Müller’s chest. In a 1956 notebook entry (published in Marika Herskovic’s 2009 survey, American Abstract and Figurative Expressionism), Müller writes, “Art is first and foremost content.” He also states, in curiously fractured English:The artist … cannot take flight to the Elysian Fields of the preciousness of perfection, the prism of the eye, but has to deal with matter complex. Given Müller’s investment in content (which, it should be stated out front, never overwhelms the paintings’ interlocking Cubist framework but rather engages it in a kind of communion), it is impossible to look at this exhibition of late paintings — almost all of them completed in the two years before the artist’s death — without meditating on the extra 24 years of life (in Christopher Marlowe’s version) that Faust received in exchange for his soul. 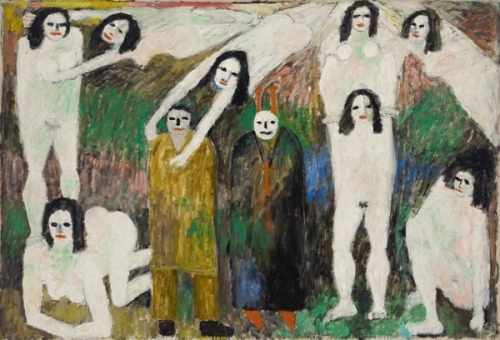 In the four epic-scaled paintings on display, “Walpurgisnacht—Faust I,” “Walpurgisnacht—Faust II” (both 1956), “The Temptation of St. Anthony” and “The Concert of Angels” (both 1957), the naked female bodies crowding the canvases are ghostly white (and in the two later paintings, they are mossy green, burnt orange and blue-violet as well). Such exquisitely modeled, unnaturally colored swaths of flesh are as alluring as they are abhorrent — especially the white, which recalls boneyards and bloodless corpses, or the snowdrifts that ruined Müller’s heart. Only in “Bacchanale Triptych,” a gem from 1955-1956, do the skin tones take on a pinkish warmth. Otherwise, Müller’s naked seductresses, who also fill his smaller works, are rendered in pale, metallic whites, greens, oranges, blues and purples — a cold carnality barely redeemed by brushy swipes of saturated color. These mocking sirens haunt a territory only someone facing an untimely death can enter — a flattened, lightless passage of still-fresh pleasures besieged by intimations of nothingness. Those 24 years weren’t forthcoming, and Müller’s life came to an abrupt halt on January 29, 1958. The images he left us with — steeped in pitiless fatalism and dimmed-over radiance — are crude, blocky, bestial and nothing short of sacred. Faust and Other Tales: The Paintings of Jan Müller continuous at the Lori Bookstein Gallery (138 Tenth Avenue, Chelsea, Manhattan) through June 23, 2012.